Amazon originally solicited pre-orders for Mattel's DC Universe Classics series 16 way back in August of Twenty-Ten. The figures had an estimated shipping date of January 1st, 2011. It's almost the last week of February, but those original pre-orders are finally beginning to ship! This is great news for those who placed pre-orders way back when and even better news for those who have been dragging their feet on this series, waiting for a good deal. Amazon is selling these for the lowest price you're likely to find this side of the clearance aisle: $14.99 plus free shipping on orders over $25 (or if you have Amazon Prime, free 2-day shipping regardless of how much you spend). 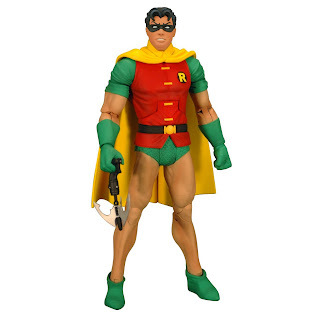 As of this post, Robin (Vintage) , Jonah Hex , Mercury , The Creeper , All Star Batman and All Star Joker are available directly from Amazon for the $14.99 price. The other figures from DCUC 16 are available, but from Amazon partners for higher prices. Keep an eye on those listings, however, as Amazon has been updating their stock regularly as new shipments arrive. I got all mine even cheaper, because each one showed up in my Gold Box for $14.49 each with free shipping. Glad to FINALLY see them actually ship! Was that back during pre-orders?